Originally from Seattle, Washington, Dr. Rachel Meyer started helping animals at the age of five. She attended Stamford University undergraduate school and graduated from Cornell University Veterinary School of Medicine in 2001. 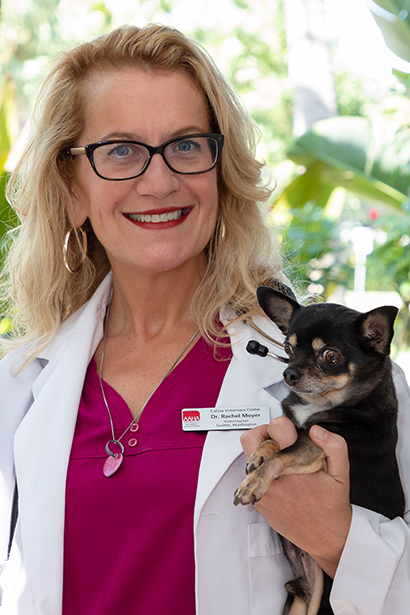 During her years at Cornell, Dr. Meyer was president of the student chapter of the Cornell American Animal Hospital Association (AAHA). In 2002 Dr. Rachel Meyer completed her internship in intensive emergency medicine and surgery while living in Santa Cruz and was hired by Santa Cruz Animal Hospital as head of emergency services in 2002. In 2003, she moved back to Seattle, Washington where she was a director of emergency medicine for 8 years. Dr. Meyer always loved warm weather and had the opportunity to serve as a veterinary medical director Hollywood. In 2014, she was offered a veterinary intensive emergency and internal medicine position in South Miami. Dr. Meyer has extensive training and a passion for guiding clients through pet loss grief. Dr. Meyer devoted six years to the Humane Society of the United States, as the director of companion rescue and protection program. She enjoys scuba diving and traveling in her spare time.